This is without doubt the toughest race I have ever competed in, over any distance, anywhere! Saying that I know that this will likely pale into insignificance as I race longer ultras and/or ultras with more elevation gain. I’ll be honest, my naivety about elevation and it’s effects on the legs and pace meant I went in thinking I’d be done in 8 hours tops if I gave it all I had. I was wrong! I started too fast and ran the first 11km harder than I should have – it made a long day even longer I think but that’s not to say I didn’t give it everything I had and I also reached my pre-race goal of finishing in the top 100 and I did this after struggling both mentally and physically up to CP4 at mile 33! Rain, rain, go away! We don’t need you on the hills today! Tangerine Pirates Endurance Squad – on the way to do battle with a bit of rain and some hills! Don’t believe everything you read on Booking.com – the hotel we ended up staying in was dingy and had a very odd vibe to it! I ended up sleeping on the floor because the mattress felt as though it was stuffed with pebbles – four hours of sleep before 50 miles of running is not the best kind of preparation. My advice to anybody reading this looking for somewhere to stay in Worthing – avoid the Kingsway Hotel on Marine Parade. My advice to anybody reading this looking for somewhere to eat in Worthing – don’t visit Thai Street Food on Bath Place. We may as well have been ghosts – we were not even acknowledged even after we took a seat. My team mate, Trev and I got a bit anxious and stressed about our apparent transformation into ghosts and promptly left, vociferously stating how poor the service was on the way out – hopefully to the chagrin of the proprietors. The race itself was pretty amazing. Although I was struggling with some inner demons and Trevor had a pretty hectic stack on a downhill at mile 3 (along with his own Gremlins) we both came away from the finish line feeling as though we’d accomplished something pretty monumental – there are some really big hills on that course going both up and down. Trev is very strong on the ups and I’m strong on the downs and this is pretty much how the day panned out for the Tangerine Pirates Endurance Squad! Trev led on the upward sections and I led (or in some cases caught up) on the down sections. Tangerine Pirates Endurance Squad – ready to roll! Trevor’s injury picked up at mile 3 – this picture was taken long after the race had finished! To be honest, up until 55km I was seriously battling with myself not to drop out – I thought about it at CP2 at 16 miles, I felt good from 20 miles up to CP3 at 26 miles thanks to Trevor getting into some racing spirit and picking up the pace to gain us some places but about a mile out of CP3 I started to seriously think about death marching to CP4 at 33 miles and dropping. Something happened here though and around 2 miles out from CP4 I began to feel much more comfortable and confident. I took on a lot of food at CP4 and left with Trev apologising for my horrible mindset and the fact I’d pretty much been running and cursing the world from mile 12 until we stopped at CP4. At this point I told Trev that he was looking strong and he should definitely make a move and leave me to my battle. Being a gentleman and a top team mate he stuck with me until my first walk break on a fairly steep climb – I called out ‘Walk’ but told me he couldn’t as he didn’t think he’d get going again. I watched him climb the hill and overtake a fair few people and resigned myself to seeing him at the finish line – the unexpected part of this was that I took heart from every person he passed and with each one I could feel myself getting stronger and my racing brain started to finally fire up!! As I have found to be the case in my previous ultras, I started to get stronger towards the end! By the time the last 25km came around I had sorted my head out a bit, stopped feeling angry towards other people, the grass, the sky and myself and switched off my pain receptors. I could see Trev up ahead, maybe a mile or so, and he was tapping out a rhythm nicely. I knew CP5 was at the end of a long descent and I vowed that I would catch up to my team mate before then – I pushed through all kinds of pain in my legs to get going but once I started I was on a roll and I knew then that the race, for me at least, was only going to get easier. I saw Trev drop into the descent to CP5 a few hundred metres in front of me at around the 40.5 mile mark and then I leaned forward and let the hill do the work! I called out when I was around 50 metres behind and Trev acknowledged my presence with a raised fist, I barreled down and then ran shoulder to shoulder into Alfriston checkpoint at mile 41.6. We both knew that the next part of the race involved the longest and hardest climb – a real beast of a hill! As we started the ascent we dropped to a serious power hike and talked most of the way to the top about all sorts from the view, to food to the fact pain had now ceased to be a factor. When we topped out I think we both felt that the rest had done us some good and we began running together and catching a few people ahead of us for a mile or two – late on in a race this is exactly what my mind needs and the fact sent power into my legs that I didn’t know was there. The next thing I know, I turned to have a quick word with Trev and he was a good few hundred metres behind me running with a small group. Trev marching up the climb out of CP5, near the top and feeling the pain! Taking a breather at the top of the biggest climb of the day out of CP5. From this point onwards I began to really pick up my pace. I didn’t look back once until I hit the road section with 2 klicks to go. On the approach to CP6 I called out for a black tea with two sugars, grabbed some jelly babies and then power hiked out, down a short road section knocking back the hot, sweet tea as quickly as I could! I shoved the empty cup into my pack and then ran to the beginning of the final climb. I could see two guys in front of me who I had been leap-frogging with all day but instead of trying to run them down on the hill I put my hands on my aching and deadened thighs and power hiked as fast as I could – my plan was to catch the two guys just ahead, and whoever might be just in front of them, on the final steep downhill section leading into the final road section! The 4 klicks preceding the final road section is exactly my kind of terrain – steep, about as technical as it got all day and pretty fast. I took off on the downhill after the final climb from CP6 faster than I might otherwise have done as a marshal standing at the top of the climb kindly informed me that if I really pushed it I could get in under 9 hours! I overtook 6 people over the last 6 kilometres. I was running scared over the last 2 klicks of road and I think the guys behind me could sense I was pushing myself to the limit! 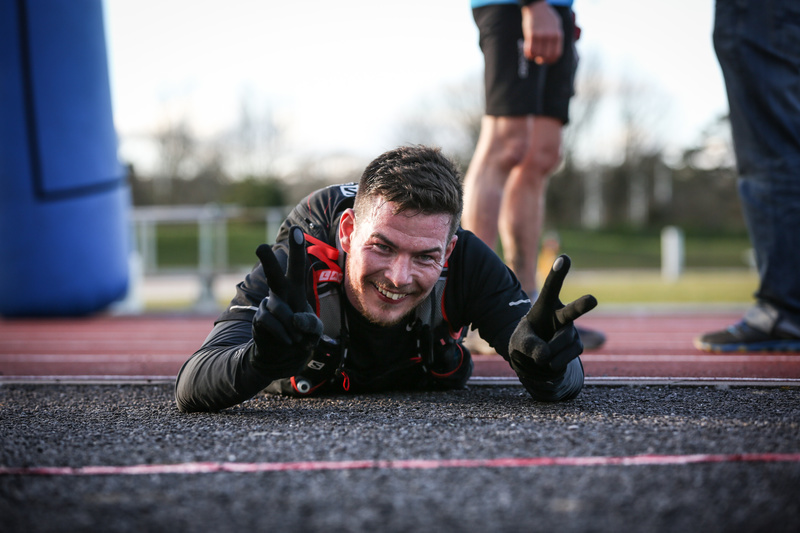 I allowed myself a couple of shoulder check backs and saw a few guys I had overtaken on the descent pulling it together and chasing me down – I could see no other runners in front of me and I just ran like I was running for the win. My feet were on fire having been used to trail all day and my brain was screaming at me to walk or at least slow down but my racing sense took over and I gave it absolutely everything I had left in the tank! South Downs Way 50, 2015. Done! One of the chasing pack did manage to run me down onto the 300m track finish – he passed me as we entered the gate leading onto the track and finished 15 seconds ahead of me! All credit to that man for racing clever and strong right to the end…and more credit to him for scraping me off the floor as I crossed the line having expended every last bit of running power I had to hold onto my final position as I was being run down by another guy onto the top bend of the track, credit to him too as he was only 7 seconds off taking me out! It was an incredible finish to an incredibly intense and tough race. It was a real suffer-fest and I can honestly say no race has ever sent me so far into the pain cave as this one and, in a sick way, I’m looking forward to the next race that pushes me this close to my physical and mental limits! 71st from 311 finishers, 9:02:55. I’m going to sign off by giving out a HUGE shout to my Tangerine Pirates Endurance Squad team mate Trevor Lee Poole. He struggled really early on and I thought he might decide to sit down and drop out at CP1 but he pulled it together and, consequently, pulled me through the toughest parts of my own race. I’m not entirely sure I’d have made it to the end without having him there to either chase down or run beside for large portions of the race! He has told me that when I began to get stronger he started to suffer but manged to pull it together when he reached the top of the final climb and took heart from the terrain and threw himself at the last descent as I would – he finished just seven minutes back from me so we both had strong finishes! I’ll be back at some point for a sub 9! Someone bring me a black tea with four sugars! This entry was posted in Post on Apr 6, 2015 by Al Flowers.